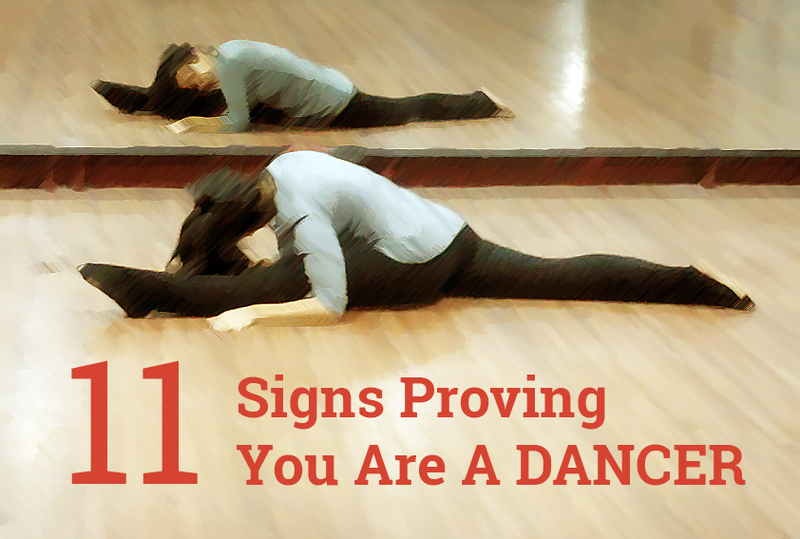 Here are the top 11 signs (in random order) that you are a dancer or have been one and some of them are specially if you have been one in India! 1. You are used to Dancing or Choreographing at EVERY wedding. Note the emphasis on EVERY wedding – whether it is a friend’s wedding, a relative’s, a cousin’s, a cousin’s friend or a friend’s-friends’ wedding – you are going to get a call to choreograph/help/dance on their function! Dropped something on the floor? No problem, your leg will automatically go up in an arabesque while you reach out to pick it up! oww…sometimes it even hits a table behind you or pulls your hamstring! I think this is the most common. Practice makes perfect and we can practice even in our head. Its absolutely normal to hear a song and imagine how you would choreograph it on stage with 50 other people or even just rehearse your dance in your head while you hear it! 4. You can break into a jig almost anywhere ! Money? Ummm… as long as you get to dance..and spread the message of dance you are ok with anything ! We are artists, we don’t work for money! Dance India Dance, India’s Got Talent, Jhalak Dikhla Ja… the list is endless, and you have known atleast 2 people who have made it like contestants or choreographers in these. They are on your Facebook, and you invariable get to know they are in even before the show goes on air! Well yes, at least 3 people you know, left the institutes they were teaching at and have now opened up their own studios to teach dance! You enjoy looking at their pictures, liking their Facebook pages and even considering joining them sometimes. This one is the toughest – ya well – dance can be a career now and it is difficult for people to understand that. You know how it felt when someone asks you what do you do at a family function and you say “Dance”, it will be followed by “and what else” (while you wonder where is time for anything else – because as per people it cannot be a full time profession! Half the battle is won when you make your family understand that – of course that takes a few debates, discussions, fights, tears and arguments but you know it was worth it! Your school or college life would not be half as interesting or meaningful if you were not a part of each and every annual day, teachers day, assembly dances, competitions, societies etc. It made you learn more than any other subject for sure! Danced your way through life, but had to give it up for some reason or the other? This doesn’t make you feel any less of a dancer, you are still in touch with your Dance, keep yourself updated and truly believe that ONCE A DANCER, ALWAYS A DANCER! True…..but not only dancers, even their mothers would relate to these points.In fact add a few of their own! I like this comment more than any other. Thanks for the list. I ticked off each. Actually I am writing a novel, the protagonist is a guy from a traditional background, an IIT, he meets girl at a foreign language class. The girl has keen interest in dance. In the backdrop is the story of the guy and the girl and it reflects how different the two backgrounds are from each other and the struggles they have to undergo to make their relationship last. I want to know more about dance since I am a novice in that area. I would be really grateful if you could give me some insights on a dancer’s career and life. i got 8 out of 11. probably means that i’m a dancer but a bad one. nevertheless, as dancer…. @harsha…once a dancer ..always a dancer..there are no bad dancers ;)…even if you could relate with only 1 out of 11…it means dance is important to you ! “You rehearse/imagine choreography in your head” – so true! I would be obliged if you could also check out my blog DoubleThink. I’ll drop its link below! DoubleThink is an up and coming blog that is extremely satisfying for every kind of a person, be it the thinker, the optimist, the pessimist, the poet, the musician, the couch-potato, the bookworm or the photographer.We are a bunch of people with different backgrounds, contradictory opinions but one voice. And this blog is our voice. Yep … all d 11 are true … felt like dancing … while reading it !!! Oh my god this is so true…..I cant even tell you how much I loved this article. Especially the arabesque part :p….like really I dont even remember when was the last time I picked something normally ….the probation part and everyother thing…I have all 11 :D…thanx alot seriously its an awesome thing u wrote…. I am. Naomi’s Mum and if u know The Danceworx then Naomi’s name is synonamous . I am a Dancers Mother and very proud to tick off all 11 boxes. I have always encouraged Naomi to follow her dreams and always do what you are passionate about! Every career is a Valid one because you are valid. If U Feel Good about what you do , that is the only thing that matters. You will be happpy! And it will show in what you DO. Some of you are not brave enough to do what is burning inside of you . You have given up Dancing because of the pressure of society, family etc.. I say to YOU; NOTHING is more important than feeling good about U as a person and NOTHING is more important than being Happpy. This is a wonderfully written article. Got such a big smile on my face reminiscing the dancing days.